Want to download thousands of pictures while you sleep? 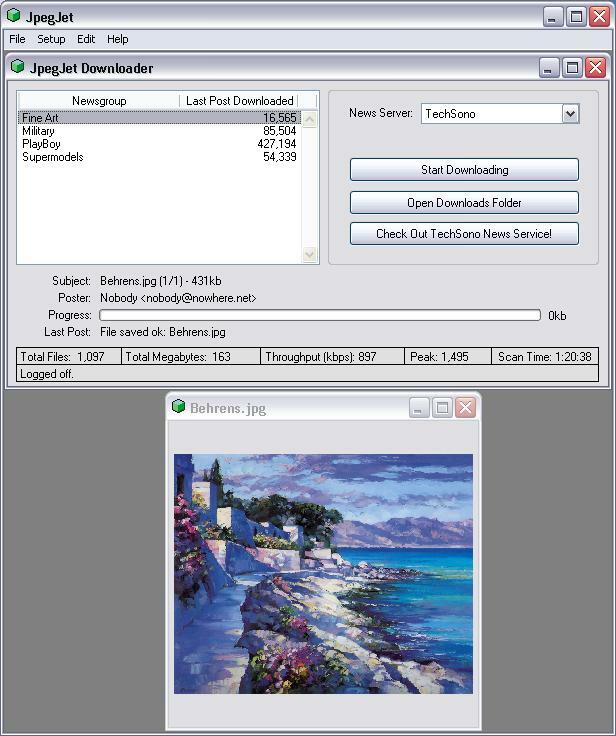 Just point JpegJet at your favorite Usenet pictures newsgroup, click the “Start Downloading” button, and then sit back and let it do all the work. Later on, you can sort through the new files and decide which ones you want to keep using a viewer program such as WatchFast. Using this method, you can review dozens of pictures per minute. This is the only way to keep up with modern newsgroups that have many thousands of pictures. JpegJet can even eliminate the duplicates (which can be as much as 50% in some newsgroups). Just turn on its DupeNuker option and it will put all the duplicates it finds in the trash. The picture viewer is also shown. You can make it any size you want, and even fill your screen with it. JpegJet is designed to be very easy to use. If you are a rocket scientist, take a look at our NewzScape product.